The group, which celebrates one year of existence on September 11, will host a week of activities beginning this weekend, to mark the anniversary. Activities begin on Sunday, with a church service; a walk through the community on Monday; a social on Tuesday, and a medical discussion scheduled for Wednesday. 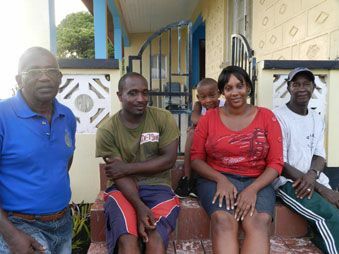 There will be a medical outreach for the elderly on Thursday, a dinner at Hotel Alexandrina on Friday and the week of events concludeS on Saturday with an AGM and election of officers. Members say the group is responsible for much of the development which has taken place within the community of Ratho Mill. The group consists of 40 members and several committees whose aim is to develop the community through forming bonds with community members. The chairman of the group is Cecil Ryan. Resident and member of the Social and Fundraising committee within the group Kelly Cyrus stated that relationships have been formed and have improved over the year. âBefore the group started, we didnât communicate. (Now) we get to know about each other; itâs like security for each other,â she said, adding that the working relationship with persons in the area has also improved. Secretary of the group Paddy Thomas said that the group started after a few residents began discussing several problems faced in the area. The discussions soon involved more persons from the community, who then decided to form a community group. The main concerns at that time, Thomas said, were the state of the roads which, according to him, were in a âdeplorable conditionâ and the break-ins and burglaries in the area, of which Thomas was a victim himself. A road committee was formed to oversee the cleaning and clearing of the roads and roadsides. A delegation also liaised with the Ministry of Works and BRAGSA to assist in the paving of roads within the community. Carson Phillips, a member of the road committee, added that they have also added an aesthetic quality to the neighbourhood, by planting palms and flowers along the roads and consistently cleaning the drains. Security within the area has also improved, as according to Thomas, the group has formed links with the Rapid Response Unit (RRU) base and the police close by. âThey usually respond quickly,â Thomas said of the RRU. Thomas added that members of the community also look out for one another, and they have also created a neighbourhood directory, in the event that anyone needs to contact the other person. âWe also have fun,â Thomas â¦ said. The social committee within the group organises fun events, such as hikes, field trips, and moonlight picnics for the entire community. The youths are not left out, as Thomas relates that they incorporate them in whatever they do. He added that it has become an afternoon ritual for youths of the community to gather in front of his home to participate in cricket and friendly chats. Phillips added that they have also formed teams and hope to enter sporting competitions. The members of the group have all agreed that the group has made a positive impact on the community. âIt has a good impact, security wise; everybody looks out for each other,â Phillips stated. The members also shared their hopes for the organisationâs future. âI can see us being a strong community organisation,â Lennox Jack, a member of the security committee said. Cyrus added that she thinks that the group can exchange ideas with other communities interested in forming a similar group, as she feels they have acquired enough experience and skills to offer assistance. Thomas added that they hope to recruit members within the Prospect area and reach out to other members in the Ratho Mill community.